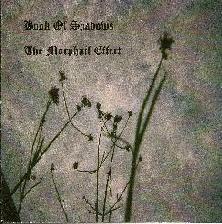 Book of Shadows - "Eternal Now" / "The Bear Queen" / "Metrognomes" / "The Secret Garden" / "The Morphail Effect" / "The Veil"
Wow, six Book of Shadows CDs to review. As their albums typically have just a handful of long tracks I'm going to shoot the works and share the entire experience with brief commentary on each. Eternal Now includes five tracks ranging from 8 - 25 minutes. "Neutron Fizz" opens with a barren, windswept planet atmospheric intro. Very cool sound effects and I was overwhelmed by the feeling of desolation. Then after a few minutes the mood becomes a bit dreamier, aided by Sharon Crutcher's trademark space whispers, and later in this 11+ minute piece the guitar adds a musical quality to the mix. "Winter Solstice" is next and right away the guitars assert themselves, creating an avant-Middle Eastern-psychedelic vibe that trips along nicely against a droning backdrop. Sharon's vocals are quiet and subtle, sometimes barely perceptible, and yet they add so much to the Book of Shadows character. A very nice 25 minute journey. "Mercury" features imaginative combinations of sound effects. I felt like I was living on a space station. "Opera House" consists of an interesting amalgam of music and sound. It starts off with the guitars creating a simple but pleasant melody which shares the stage with a myriad of elements. Lots of transitions throughout this piece and things get quite intense at times. This is also one of the more detailed tracks on the album, requiring an attentive listen to really pick up on all that's happening. Finally, "Self Not Self" is a deep space meditative track that makes for a satisfying close to this excellent album. 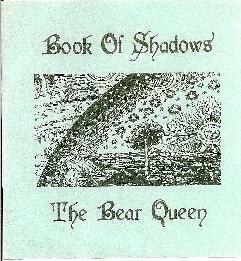 The Bear Queen is a 6 track set with both long and shorter tracks. "The Circle is Morphing" opens the set with 21 minutes of eerie, haunting, moody atmospherics. It's spacey indeed, with an avant-folk-psychedelic vibe. Some of it reminds me of The Spacious Mind in their trippier, subdued moments, though Book of Shadows have a more experimental edge. 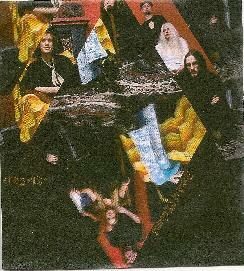 On "Hecate's Cavern" the guitars and bass trip along busily against the drifting soundscapes. An interesting prog-psych-ambient piece. At 22 minutes, "As the Eye Passes Over" is another lengthy journey. This one covers a lot of ground, from harsh to calm, and there are a couple aggressively noisy bits that I quite liked. There was a lot that I enjoyed, though overall it came across as separate sections strung together. And some of the parts sounded like the musicians were noodling a bit too much and struggling to find common ground. So it didn't really flow that well for me as a continuous piece. "The Gingerbread House" is a short pleasant track, though four minutes for a Book of Shadows track is like sneeze and you'll miss it. But we're back in form with the 14 minute "June Bug", which begins with the trademark Book of Shadows brand of haunting experimental psychedelia. Busy guitars, one of them getting nicely acidic, and Sharon adding a ghostly ethereal feel. A cool combination of psychedelic aggression and meditative drift. In contrast to "As the Eye Passes Over", the band gel with one another from the start. At their best, Book of Shadows bring together multiple contrasting elements into a cohesive whole, of which "June Bug" is a shining example. The listener can trip along and enjoy the music, or give it deeper and more discerning attention to appreciate all that is happening. Good one! "Kind" is the final track and is an enjoyable floating avant-ambient-psychedelic journey. Sharon is in bewitching angelic mode. And one of the guitars kept reminding me of the intro to The Doors song "The End", which in a Book of Shadows context was nicely weird. Metrognomes is a five track set that starts off with the lengthy title track. It begins with a quiet drone, howling wind and Sharon's vocals alternating between pulsating whine and anguished wail. It gets a bit disturbing at times. After a while the guitar (or bass?) kicks into a rhythmic groove which would have been interesting to develop but it doesn't last. Various bits like that crop up throughout this 28 minute piece. I like the acoustic guitar doing a bluesy jam, which sounds surreal against the intensity of the principle theme. Killer opening track. Book of Shadows set a basic theme and stick with it, getting increasingly intense, adding in accompanying parts, and the whole thing kept me riveted throughout. Would be a great soundtrack to an avant-garde Dario Argento horror flick. The band set the bar pretty high with that opening epic. "Twoedit Gnos" is next, consisting of soundscapes, drones and gentle vocals. The guitars guide the direction of the piece on this one, with subtle patterns and even rocking out a bit And the rocking - to the extent that Book of Shadows "rocks" - continues on "Ong Ones", as the band get a bit into Shoegaze territory. Pleasantly meditative psychedelic drift (though the dog barking threw me off a bit). The 20 minute "Ifev Gons" is another track that is strangely but interestingly musical. The vocals alternate between tribal chanting and harpy howling. And more wind… wind seems to be a theme on this album. The guitars play a choppy melody throughout, while the soundscapes and vocals slowly evolve and guide the evolution of the piece. Finally, imagine "Ifev Gons" with the guitars front and center and the wind and vocals drifting quietly in the background and you'll get the closing track, "Gnrooufs". 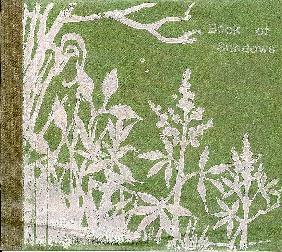 On The Secret Garden we hear Book of Shadows moving in a slightly different direction, which is a good thing given their fairly high output. It's certainly the most purely musical of the albums I've heard in this batch, and includes more and shorter tracks. "You Have Gypsy Eyes" is a trippy, rocking psychedelic tune. A steady rhythmic pulse maintains the pace as guitars and vocals explore and light atmospherics create a spacey aura. "Elorarkar" is similar but more guitar driven. The guitars explore, creating pleasant melodies and a mostly peaceful, meditative mood, and even get a wee bit Bluesy in parts. Nice. "Glistening" is next, and after a brief pulsating and rumbling electronics intro, we go into… surprise surprise… an actual SONG. Yeah, with lyrics. This took me by surprise. Hauntingly spacey, mellow, and very beautiful. "Cassiopeia" is a mellow bit of ambient space rock, with steadily tripping guitars, rhythmic drones, cosmic electronics, and angelic space whispers. "South Wind" is similar but without the guitars. I like the combination of almost Mellotron-like keys and freaky alien electronics. On "Inside My Heart Lies a Fluttering Bird", the first half is electronic driven with a catchy melody. The second half transitions to something a little different. It's still got melodies, but it moves around such that it seems to be trying to tell a story. Very nice. "Walking on Thunder" is a cool blend of shimmering electronics, mellow keyboard melody and vocals. But this is another one that shifts gears mid-section. Now we're off into dark, doomy space-prog territory, which makes things briefly scary, only to wind down in freaky electronic space. Lots happening in just seven minutes. "Garden of Secrets" is a guitar and voice combo, with both Sharon and Carlton credited with vocals. Aaron Bennack's solo guitar holds its own quite nicely, being simultaneously melodic, atmospheric, and acidic. Very beautiful. I'd love to hear more of these guitar-vocals duets. And at 15 minutes, "Welcome The New Age" is the lone stretch out track of the set. 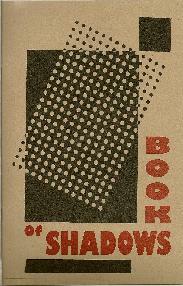 Book of Shadows excel at being quietly and subtly aggressive. The piece starts off with a glom of rumbling drone-psych and bits of jazz. But the volume and intensity level soon increase as the music evolves into a noisy freeform psych fest. There is an element of controlled chaos, like a hungry roaring lion that's safely in its cage. Fans of the more experimental side of improvisational psychedelia will find much to enjoy on this one. The Morphail Effect starts off with "Light Refraction Through a Broken Pane of Glass", a slowly developing minimal soundscape and drone piece. The sparse action is provided mostly by guitar string manipulation and restrained electronics. "Elkko" is next, being a combination of trippy, noisy and spaced out avant-psychedelia. Freaky, spacey and acidic guitars plus space whispers and alien electronics jam along. This is another one of those quietly understated yet elusively complex Book of Shadows tracks that I really enjoy. It's a little over 21 minutes and I would have been content for it to just keep on going. Music for your head, with the usual Book of Shadows experimental edge. 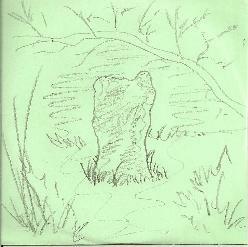 "Enigmatic Fern Seed" is a brief track that comes across as a coda to "Elkko". In contrast to "Elkko", "The Dancing Smoke Rises" went on way too long for me. Maybe I was still fired up about "Elkko". It's 34 minute soundscape piece that just seemed to be too static. The band sounds like they got locked in a basic theme that doesn't really go anywhere. Finally, "The Demise of the Steamer Screw Ship" is a very short - less than 2 minutes - guitar piece that is like the start of something, though it's really the end of the album. The Veil begins with the 24 minute "I Heard Thunder", on which Book of Shadows blend electronics, guitars, percussion and vocal effects to create an avant-space trip. This is a lengthy but controlled track that has a freeform improvisational feel. It frequently shifts gears, but never lacks direction and even sounds in parts like the soundtrack to a story. Lots of aggressive guitar bits, but also spacey ambience, bits of old time jamming Krautrock, and even some melodic passages. The title track is a very pleasant and ethereal piece dominated by guitar and vocals. In the first several minutes the guitar sounds like something from an Ennio Morricone soundtrack, which conjures up some pretty crazy images. "The Wind Song, Six Directions" is a melodic piece, combining folky acoustic guitar with space whispers and freaky electronics. I like the contrasts on this tune. At 31 minutes, "Chaindrive" is the epic of the album. There's lots of great intensity throughout this track, like the early minutes that brought to mind a Book of Shadows take on Goblin's Suspiria soundtrack. And then around the 10 minute mark we get a rocking segment and Sharon in delirious witch-harpy vocal mode. There's also some excellent spaced out atmospheric yet intense passages and things get downright scary at times. The band work with and develop a number of interesting ideas on this track, though I detect a little fumbling during some of the transitions which interrupts the flow. But overall I enjoyed it. "My Butterfly Dreams" is a short but very beautiful piece. And the closing track, "Confined to Space", is similar, with a haunting yet heavenly feel at times. Really nice flute and percussion.